Elton, Sarah. "Pouding Chômeur". The Canadian Encyclopedia, 28 January 2016, Historica Canada. 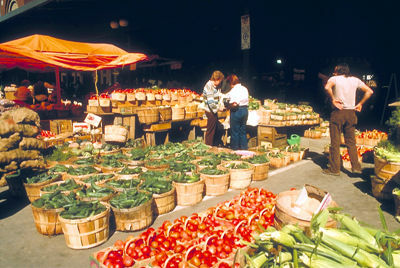 https://www.thecanadianencyclopedia.ca/en/article/pouding-chomeur. Accessed 18 April 2019. ​The Québécois dessert called pouding chômeur — poor man’s pudding, or more literally, pudding of the unemployed — is delectably rich and incredibly simple. The Québécois dessert called pouding chômeur — poor man’s pudding, or more literally, pudding of the unemployed — is delectably rich and incredibly simple. The dish consists of a dollop of batter baked in a pool of caramel. It is most similar to a saucy pineapple upside-down cake, minus the fruit. 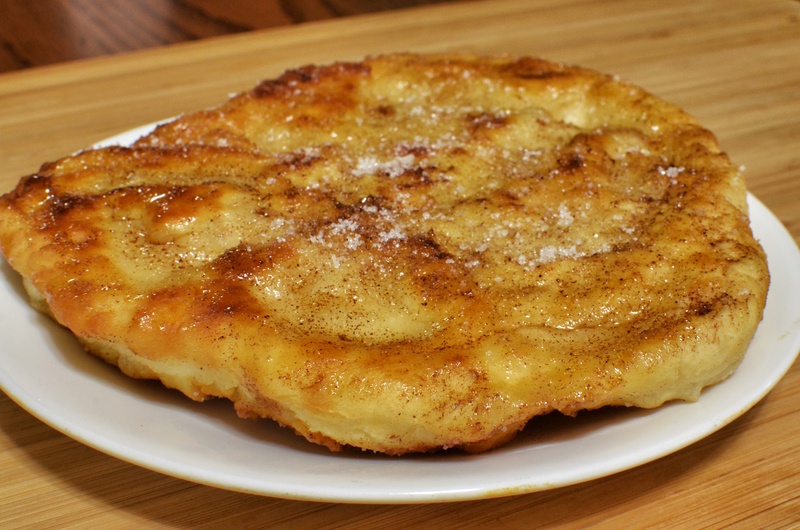 Legend has it that the pouding was created by factory workers during the Great Depression, women making do with few ingredients, including butter, flour, milk and eggs. The sweet caramel sauce that bathes the simple batter was likely made from brown sugar during economic hard times, and was later replaced with maple syrup. The dessert is considered to be quintessential Québécois cuisine and The Oxford Companion to Food notes that it draws on French cooking techniques that were adapted to a new environment. 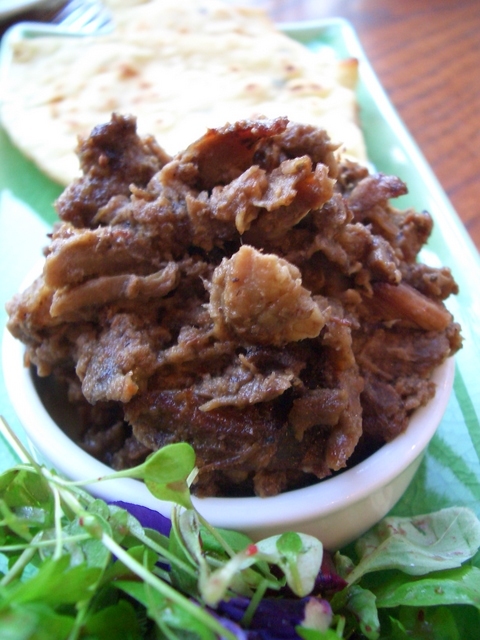 Made with maple syrup, as opposed to brown sugar, the dish is an example of the province’s syncretic cuisine that, since colonization, has combined ingredients from Aboriginal traditions with European foods. 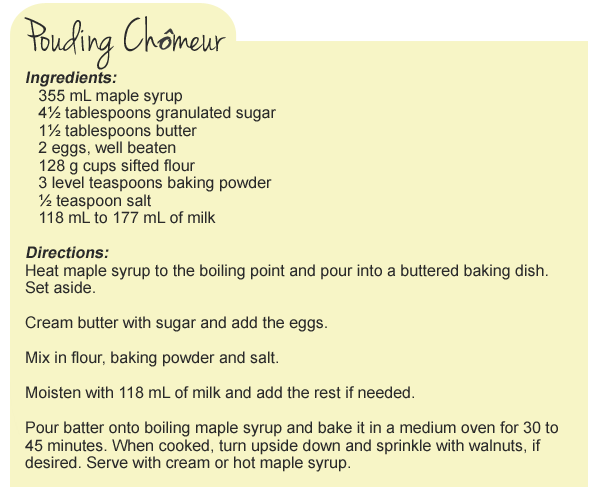 Pouding chômeur was commonplace in Québec home cooking until recently. 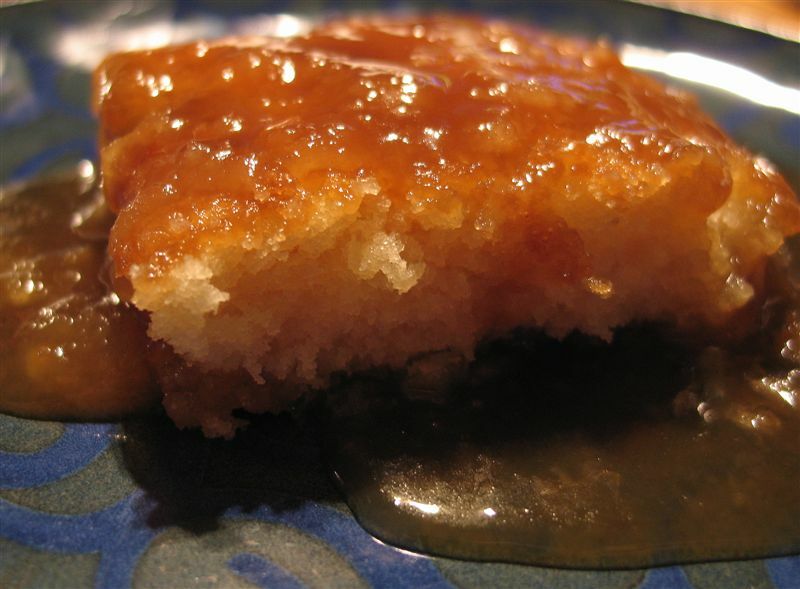 As accessible as a caramel-doused cake might be to people outside of Québec, in 2010 it was noted in The New York Times Magazine that the dish was a “delight that Canadians have been keeping to themselves” — or more accurately, the Québécois. Although a Québécois staple, a recipe for a dessert called maple pudding, was submitted by a Mrs. Marion Miller to a community cookbook titled Recipes from Ottawa Hostesses in 1960. This shows that the dish did at least cross into Ontario, though Mrs. Miller’s recipe is dressed up with walnuts. It wasn’t until the 21st century that chefs in Québec started to look back to their childhoods and beyond for inspiration, retrieving old recipes, including pouding. A modern version of the dessert has been offered in trendier restaurants in the province, including at Martin Picard’s Au Pied de Cochon. Its current incarnations in more prosperous times are even richer, often incorporating cream in the caramel. As well, pouding chômeur can be found on menus outside of Québec. The CBC program Best Recipes Ever and Canadian magazines devoted to food all present recipes for the dish.